2003: The Victorian Year in Steam: Again we recorded footage all of which is history and much of which is gone forever. 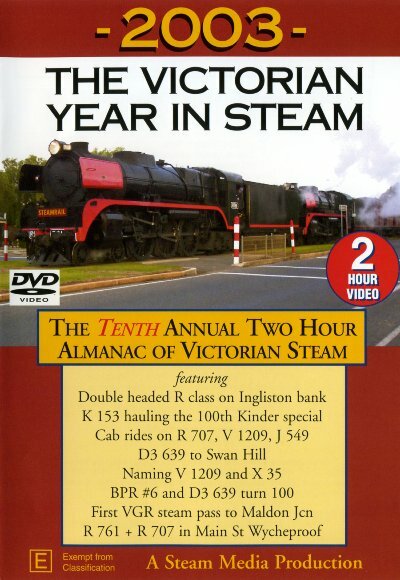 2003 saw many unique events for Victorian steam. Two locos became centenarians, K 153 ran the 100th kindergarten special to Bacchus Marsh. Two dedicated enginemen had locomotives named in their honour. Double-headed R class, always a railfan favourite, traversed Wycheproof's main street. Five inch gauge 3-cylinder S & H class steaming at Wandong.